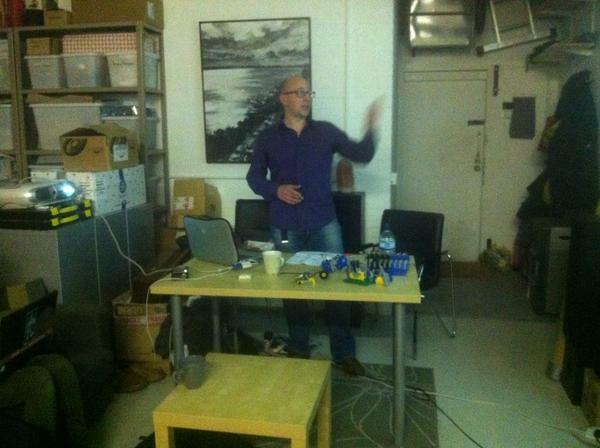 Last night I did a presentation at the Music Hackspace in London, talking about my process and demonstrating some of the mechanical, electronic and software elements that have gone into my pieces. I’ve uploaded a zip of my presentation and some of the supporting files to my site, this includes some in-progress code and circuits which may be helpful. It was great to meet the group last night, very chilled out and amazing stuff going on at the hackspace, with an spectacular workshop. What ever D9(?) is, it’s the chord that opens Clapton’s version of Hard Times with a bit of extra pinkie action x54557.